Generally I try to avoid the supermarket with the kids as much as possible, but during the holidays have little choice but to drag them along. So the other day in between the bananas and checkout I showed them the ‘Vegie Smugglers’ blurb in Super Food Ideas. Massive squeals of excitement burst forth from Miss F and Mr M&P. They were so surprised to see me in a magazine that they caused a huge ruckus. ‘ssshhhhhh!!!! !’, I panicked, feeling like the Sally Field character in Soapdish, as if I’d set the whole scene up for a bit of supermarket glory. But I have to admit that their excitement was cute. Especially since they think their mum is a bit of a layabout. “Why don’t you work, mummy?” they ask as I place dinner down at the end of a day of shopping, cooking, photographing, illustrating, ironing, tidying, organising, publishing, cleaning and sticking bandaids on children. Wryly, I grit my teeth, “Mummy works [slaves] at home”. I resist the 2-hour diatribe on the struggles of work/life balance, unsatisfying part-time work, unpaid labour and the demands of two little children. It brought home that you can never win in this mothering malarky. The choice to work at home may have been primarily made to advantage them, but my career sacrifice will be lost on them (as it should be, it’s my choice after all). 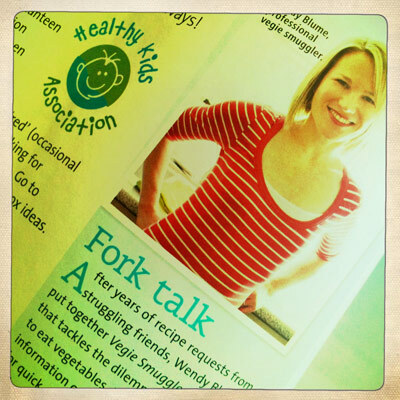 Why such a malingering mum is in a major food magazine is lost on them too. In their minds it must just be a happy coincidence. Perhaps they will try to figure that one out in a few years time.